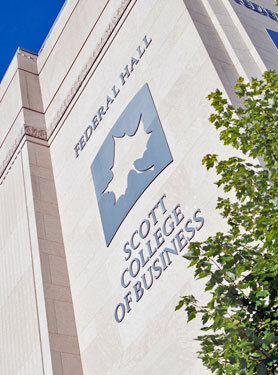 Thirteen of the best and brightest students interested in careers in the financial services have earned Indiana State University's prestigious Networks Scholarship through the university's College of Business. The 2006 class of scholars represent the fourth year for this elite program. Recipients of the Networks Scholarship receive a four-year, $20,000 scholarship to support the cost of tuition and fees, a $3,000 professional development account, and a new wireless laptop computer. Scholars also participate in a variety of professional development activities, including at least one paid internship, an international experience, interactions with an ISU faculty mentor during the freshman and sophomore years, and an executive mentor experience during the junior and senior years. Indiana State University's Networks Financial Institute (NFI) is hitting the road with its new mobile financial literacy classroom. 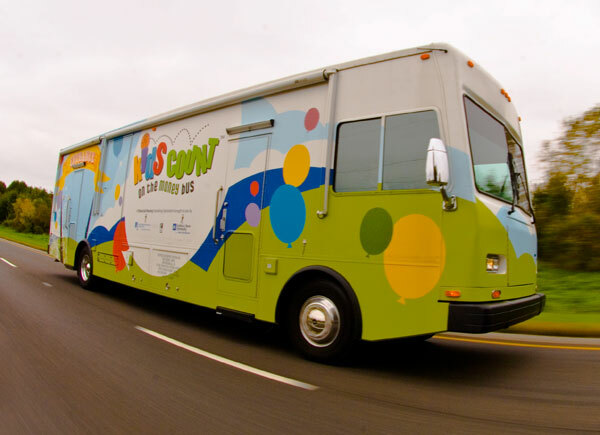 "The Kids Count on the Money Bus" or the "Money Bus," for short, is a visual, hands-on way of exposing young students (particularly in grades 3 to 5) to financial concepts, such as saving or spending wisely, managing financial accounts, using credit and debit cards, and much more. The bus - a 40-foot passenger coach - has 13 hands-on exhibits which make learning about money fun and exciting. Indiana State University's Networks Financial Institute (NFI) has unveiled an exciting and innovative concept in the world of financial literacy education - an interactive classroom on wheels. The "Kids Count on the Money Bus" - or the "Money Bus," for short - will be a visual, hands-on way of exposing young students, particularly in grades three through five, to financial concepts, such as saving and spending wisely, managing financial accounts, using credit and debit cards, and much more. The Money Bus officially made its debut April 10 as part of NFI's second Indiana Financial Literacy Conference in Indianapolis in conjunction with April being National Financial Literacy Month. It will be unveiled for ISU dignitaries, legislators, supporters and friends of ISU at a special reception April 20 at the Children's Museum of Indianapolis. The reception will take place as part of NFI's financial literacy community event - "An Evening with Michelle Singletary." Singletary, author, television host and nationally syndicated Washington Post columnist, will use her humor and down-home style to educate attendees about financial literacy and the importance of saving. To get a better understanding of the state of financial literacy instruction, NFI conducted a survey of teachers of Indiana's youth from kindergarten through 12th grade. In the process, they learned a lot about what is and isn't happening in the area of financial literacy in Indiana's classrooms. Based on the research, it was determined that 46 percent of the teachers polled do not teach financial literacy at the kindergarten through fifth-grade levels, and 54 percent do not teach financial literacy at all. This situation exists despite the fact that 80 percent of K-12 teachers polled feel it is important to teach financial literacy in their classrooms. Seventy-five percent said they would teach more about financial literacy if there were academic standards directly relating to it. Armed with this information, NFI turned its attention to tapping into the desire and energy that most Indiana teachers have for teaching financial literacy, in part, by addressing the specific barriers they face - time, resources and clear standards. "Our hope is that the Money Bus will be a catalyst for change in the hearts and minds of Indiana's educational and political leaders," said Elizabeth Coit, executive director of ISU's Networks Financial Institute, "that the bus will add critical weight to a move toward an integrated, standards-driven financial literacy program from kindergarten through high school." As early focus groups were conducted, very clear ideas surfaced as to what the Money Bus should encompass. First, it needed to be available at little or no cost to the schools. Its primary focus should be on learning rather than entertainment, with a solid, comprehensive curriculum at its core. Finally, the curriculum must be mapped to Indiana academic standards in order to be relevant. Bringing such a creative, detailed concept to life took many hours, minds and hands, including manufacturer Farber Specialty Vehicles; designer Rowland Design Inc.; builder Murphy Catton Co.; and curriculum developer Words and Numbers Inc., in conjunction with Priscilla Wolfe, director of the Leadership Development Institute in ISU's College of Business; and many others. "This is truly a one-of-a-kind initiative," said David Godsted, director of outreach for ISU's Networks Financial Institute. The Money Bus curriculum will be experienced through an in-school bank and 13 different financial literacy activities inside and outside the 40-foot passenger coach. Two features are swipe-card technology to track a student's participation and purchases while on board, and the "Build Your Own Sundae" exhibit which shows students how sundaes vary in price based on the ingredients. "The Money Bus is important in ways far beyond the students' lives it will benefit," said Ron Green, dean of ISU's College of Business. "It will act as an outreach for ISU, connecting younger students with the university's financial literacy programs. We hope that this will increase interest across the state and region in ISU's academic programs and initiatives." NFI will pilot its Money Bus program this spring and through the summer months. Official visits will begin this fall. The bus's future activities will be coordinated by a staff facilitator, who will schedule activities with schools, teachers, volunteers and students. The President's Scholarship is the top competitive scholarship at Indiana State (students in top 10 percent of high school class with at least 3.7 out of 4.0 GPA). Networks Scholarships are for students studying any area within the realm of financial services (marketing, finance, insurance and risk management, accounting, etc.). Gongaware Scholarships are for students specifically majoring in the field of insurance and risk management. "Treat others as you would expect to be treated." Much like the Ten Commandments of life, this is essentially one of the Ten Commandments of business as well, according to Jeff Taylor, president of Pearson, Inc., and one of several presenters at Indiana State University's first-ever conference on "Ethics and Corporate Responsibility," March 27. The conference was sponsored by ISU's College of Business and Networks Financial Institute at ISU, and the university's Networks, President's and Gongaware scholars worked hard to make the event a tremendous success. Conference planning and logistics are part of the scholars' junior year objectives - to enhance both experiential learning opportunities and leadership skills. ISU to Host First Conference on "Ethics And Corporate Responsibility"
The conference is being planned and executed by Networks, President's and Gongaware scholars, all in their junior year of study at ISU. Networks Scholars are students majoring in any areas pertaining to financial services (finance, marketing, insurance, etc.). Gongaware Scholars are students studying insurance and risk management. President's Scholars are the top scholars at ISU. Financial illiteracy is becoming widely recognized as a fundamental problem in the United States. As many as 40 million Americans do not use mainstream banking services, and only 27 percent of adults feel well informed about managing their own household finances. These statistics seem unrealistic for the 21st century, but if this is the state of the problem, then how are we to arrive at a solution? Indiana State University's Networks Financial Institute is bringing together a national panel of experts March 28 to discuss the state of adult financial literacy in the U.S. today as part of its ongoing Financial Forum Series. They say there are two sides to every issue, and in the case of a proposed optional federal charter (OFC) for the insurance industry, this has never been more true. Two very different positions on the issue emerged today (March 1) as part of Networks Financial Institute's third annual insurance summit at the Ronald Reagan International Trade Center in Washington, D.C. The summit was presented by NFI at Indiana State University and sponsored in part by B&D Consulting LLC. "The idea of insurance regulatory reform is a growing topic, and we're happy to be playing a lead role in bringing these key decision makers together to discuss it," said Liz Coit, executive director of Networks Financial Institute at Indiana State University. "This year's summit has enabled us to engage in some very active dialogue regarding the industry." The Indiana House and Senate recognized Indiana State University's Networks Financial Institute yesterday for its continuous efforts to increase and improve human resources for the financial services industry and well as its in-depth and far-reaching financial literacy initiatives throughout the state. "We're really pleased to gain this kind of recognition for a program of study that is really important for preparing future leaders in financial services for the state," said ISU President Lloyd W. Benjamin. "Our goal is to continue to build on the success we've had for the past four years as we continue to attract some of the brightest and the best who want to be involved in that industry." Representatives of Indiana State, Networks and the Networks Scholars Program were present as the House and Senate presented the joint resolution on their behalf. One reason for the resolution, which was introduced by Rep. Clyde Kersey and Senator Tim Skinner, was the fact that Indiana State provides vital resources to the financial services and insurance and risk management industries via the prestigious Networks Scholars program. ISU's Networks Financial Institute Presents Third Annual Insurance Summit in Washington, D.C.
Should there be a federal role in insurance chartering and regulation? If so, how might this impact the industry? Leading figures in financial services and government will share key issues and perspectives on the effects and potential of insurance reform as part of the third Networks Financial Institute (NFI) Insurance Summit March 1 in Washington, D.C. The event will take place from 8 a.m. to 1 p.m. at the Ronald Reagan Building and International Trade Center. Scott Harrington, who is Alan B. Miller Professor at the Wharton School, University of Pennsylvania, will discuss "Federal Charters for Insurance Companies: Options and Alternatives;" Harrington is former president of both the American Risk and Insurance Association and the Risk Theory Society and is currently on the Shadow Financial Regulatory Committee (American Enterprise Institute).